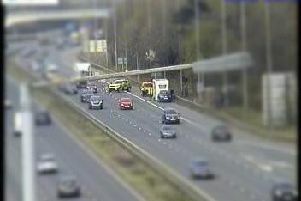 A multi-vehicle collision on the M6 in Cheshire has forced police to shut the carriageway to southbound traffic. The collision happened at around 2am at the southbound entry slip road at junction 19 (Knutsford Services). It involved two HGVs, two vans and a car which overturned. 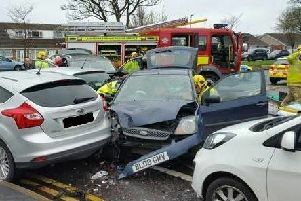 Ambulance and fire crews attended, but it is not known how many people are injured or the severity of their injuries. Police immediately closed the M6 southbound between junctions 18 (Middlewich, Holmes Chapel) and 19 (Knutsford) to deal with the incident. Traffic was held for nearly two hours before traffic officers made the decision to turn traffic rearward and back to your junction 21 at Warrington. A multi-vehicle crash has forced police to close the M6 carriageway in Cheshire overnight. All lanes remain closed and Highways England expect the carriageway to reopen at around 11.30am. An investigation is ongoing into the cause of the crash. A spokesman for Highways England said: "M6 southbound junctions 19 to 18 are likely to remain closed throughout the morning peak period. "Once investigation work is completed, recovery work and scene clearance will be carried out. "There is glass and fuel across the carriageway which will require an extensive clean-up. "So if you are planning to head that way, please be advised there will be a lot of congestion on the approach and surrounding roads. Have a safe journey."